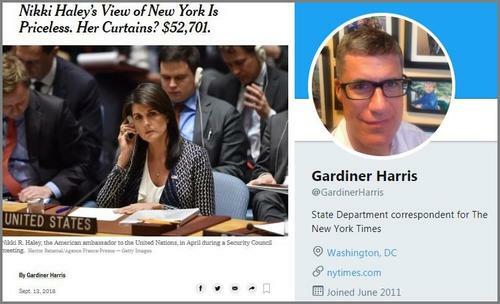 The New York Times on Thursday wrote an incredibly ham-handed hit-piece on UN Ambassador Nikki Haley, suggesting that she had spent over $52,000 on curtains at the official ambassador’s residence. Except, she didn’t. The curtains were installed during the Obama administration, while Susan Rice stayed there at a cost of approximately $135,000 per month – over twice what Haley’s rent costs, according to the Daily Caller‘s Kyle Becker.